Shown above are two Christmas Children 5" tall. These are made with simple heads (will also be available separately), and all cotton batting bodies (have pipe cleaner base bodies) and clothing. No sewing, only cut the expertly designed patterns, glue a few seams together, glue on trims and optionally glue to included bases or apply hang loops. These are just the first two. Later will be Santas, angels, snowmen, and more figures and animals too. 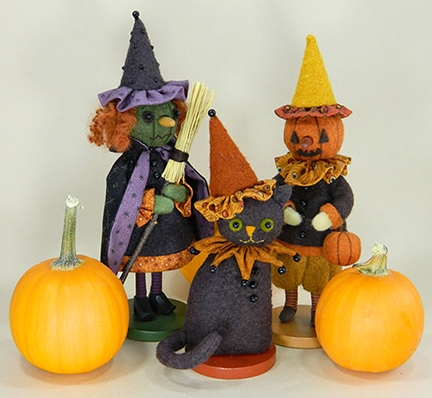 Complete kits with trimmings and accessories will be available or purchase the patterns and molded heads and supply your own dyed batting (dye with Rit with instructions in patterns - easy). Sheep is modeled after my extensive collection of antique sheep like him. I was inspired long ago to collect these because our little historic town library has a huge and wonderful similar collection on display in honor of Acworth, NH, being a real sheep town having produced more wool for Civil War uniforms than any other single place. Until very recently, there could always be seen several hundred sheep grazing around town. I always had about 4-6 of my own. The little pulltoy has a molded body, tiny metal wheels, a bell and the rest is precut wood parts that assemble easily. All materials are included in the kit with extra parts available for those liking to add this little guy to their dolls or Santas as accessories. THE SNOWMAN - Another in the growing series of cotton batting characters ready for shipping either kit or finished on December 6. 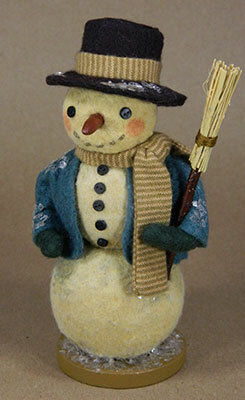 About 5" tall with button eyes, carrot nose, stitched mouth, bendable arms to hold his real broom. Kit comes with all supplies including hand dyed cotton battings, paints for nose and base, all trims, stand and real vintage mica flakes for some winter sparkle. 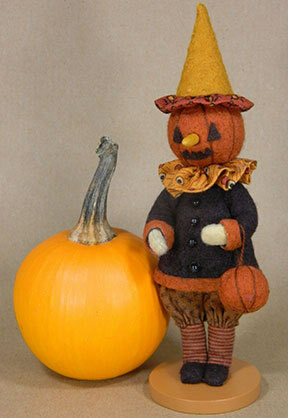 Tiny real pumpkin (3" diameter) is one from our gardens. THE PUMPKIN MAN - The PumpkinMan and a Snowman (available in mid-November) were new cotton batting characters taught at two workshops at the R John Wright Convention in late September. We have just finished kitting this guy and have made a small number of finished ones. 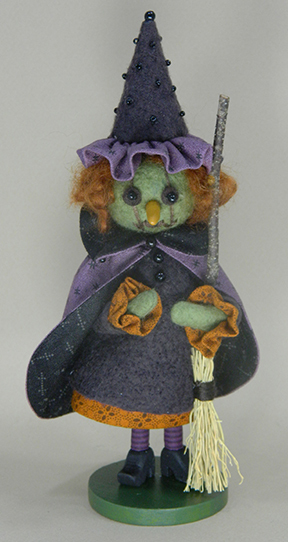 Kits are easy to make - the whole process is mostly gluing (a tiny bit of easy sewing). All cotton battings are prehand dyed for you. 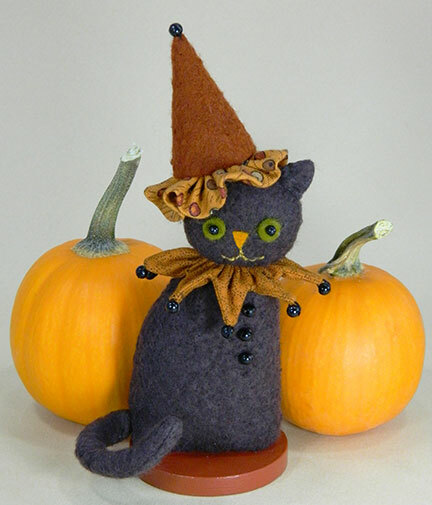 New Cotton Batting Character - THE HALLOWEEN CAT (6-1/2" tall from tip of hat) - new to my other Halloween characters shown above. Kits and Finished are offered. Everything needed in the simple to make kits, some minimal sewing needed. What a group. 2019 will see additions.